In April 2016, Wilfrid Laurier University became the first Canadian university to partner with Jusoor Syria, a non-governmental organization (NGO) dedicated to connecting Syrian youth with post-secondary scholarships abroad. Eighteen months later, Laurier’s first Jusoor scholar, May Mahrat, graduated with a Master of Arts in Cultural Analysis and Social Theory. 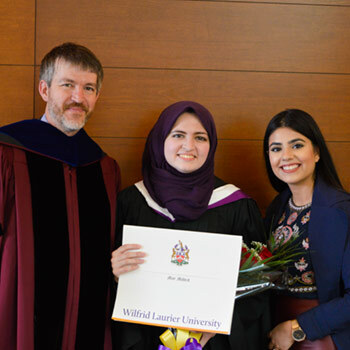 “I am so lucky to have found Laurier,” says Mahrat, who was one of 10 students studying at Laurier through Jusoor Syria’s ‘100 Syrian Women, 10,000 Syrian Lives’ scholarship program. The scholarship program, one of many administered by the NGO, is open to Syrian women who have demonstrated exemplary social service with leadership, academic excellence and civic responsibility. The applicant’s character, which should reflect the importance of empathy, humility, courage and resilience, and the potential to serve as global leaders, is also considered. As an undergraduate student in the United Arab Emirates, she volunteered with a campus group to establish a library at a Syrian refugee camp in Turkey. The library was set up to provide Arabic educational resources to those in living in the camp. It also offered the camp’s student-youth access to information and reading materials while waiting to resume their studies. Mahrat could relate to the frustrations of those students because she was once in their shoes. Her undergraduate studies at Albaath University, in her hometown of Homs, Syria, were thwarted by the outbreak of civil war in 2011. “I remember riding the bus to classes one day when the driver suddenly started shouting, ‘Get down! Get down!’” says Mahrat. She said the driver could see gunmen on the streets and became worried for his riders’ safety. She also recalls running from a campus lab when bullets sprayed through the windows. The humanitarian crisis in Syria has uprooted millions since 2011, prompting governments, NGOs, community groups and educational institutions to respond. In 2013, students in Professor Gavin Brockett’s first-year seminar on the Israeli-Palestinian conflict were inspired to take action. They formed International Students Overcoming War (ISOW) Laurier, the campus club that spearheaded the university’s partnership with Jusoor Syria. Mahrat says ISOW helped to ease her transition into life as a graduate student in Canada. Personal touches aside, Mahrat says the support she received from ISOW was invaluable. There was regular email contact from the group’s president at the time, Annie Serez, ahead of Mahrat’s arrival at the Waterloo campus in the late summer of 2016. Serez and Brockett helped Mahrat navigate through challenging visa issues, liaising with the local Member of Parliament when it was denied. Mahrat’s parents were not able to attend their daughter’s convocation ceremony in October; they have applied to Canada as refugees and are awaiting a decision. Mahrat’s parents may have been absent from the ceremony, but her Golden Hawk family showed up in full force. Laurier faculty members Meena Sharify-Funk, Ali Zaidi and Alicia Sliwinski attended Mahrat’s convocation ceremony. Brockett hooded the student he helped get to Laurier just over one year earlier. Mahrat continues to draw on the support and genuine care she felt from her extended Laurier family in her work as a youth coordinator at Reception House in Kitchener, which provides refugee assistance to approximately 400 families each year. Mahrat works with Syrian youth between the ages of 15 and 25 years of age, connecting them with schooling, English language classes, homework assistance and social programs. She is also working on the launch of a friendship circle program for Syrian youth in Waterloo region, as she feels they experience a ‘state of isolation’ as they adjust to their new lives in Canada.